A complete cast copper alloy horse harness pendant dating to the medieval period. The harness pendant is cast in the form of a sexfoil, a six-armed star or flower with a raised central moulding of a possible three-stemed flower. Traces of red enamel survives in the centre of the pendant. Each arm of the sexfoil has an expanded and rounded terminal and traces of gilding can be seen on bth the front and reverse of the pendant. The reverse is flat and undecorated. The integral and broken suspension loop is set perpendicular to the pendant's body. 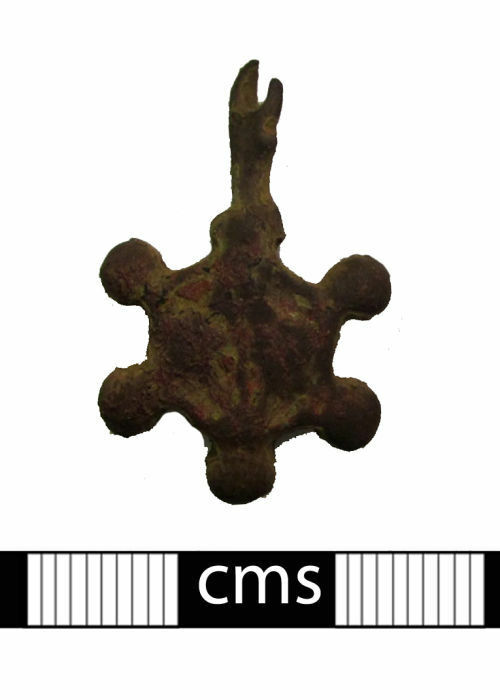 It is possible that this is the central element of a two-part pendant, the second part being an openwork tressure into which this sexfoil would have fitted; this would form the swinging element of the harness pendant. For a similar and complete example see SF-061760. Horse harness pendants of this sort are generally dated to the later 13th and 14th centuries AD. A similar pendant was found nearby.